A growing body of research on moral markets—sectors whose raison d’être is to offer market solutions to social and environmental issues—has offered critical insights into the emergence and growth of these sectors. Less is known, however, about why some firms enter moral markets while others do not. 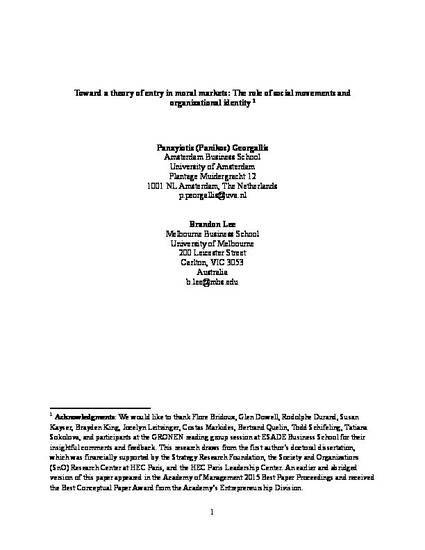 Drawing from research on market entry, organizational identity, and social movements, we develop a theory that highlights the potential of organizational identity to explain variation in entry into moral markets. We then expand our framework by theorizing about contingencies that alter the shape of the relationship between organizational identity and market entry: the type and orientation of the social movement supporting the moral market, the flexibility of organizational identity, and the mode of market entry (de novo vs. de alio). Finally, we discuss the contributions of our framework and opportunities for extension.